While in New York last week we stepped into a bakery / restaurant to get out of the heat and have something cold to drink. 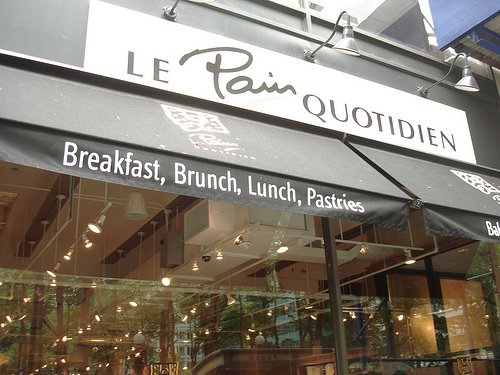 From the moment we walked into Le Pain Quotidien, which means, the daily bread, it was a lovely experience. The menu was delightful and organic (we shared a blueberry & corn scone with fresh ricotta and wild blueberry jam) but it was the decor that really caught my attention. The tables were long communal tables (all made out of reclaimed wood) with overhead industrial lighting. It was simple yet welcoming. Friends and strangers alike come together around our communal table to break bread and linger for a while. Like all of our furniture, the communal table is made from reclaimed wood, which means no trees were sacrificed for us to sit and unwind. Take a seat next to a neighbor, and be reminded that, even in the big city, we are a community. I love the idea of communal dining (so very French) although we opted to sit in a corner by ourselves sandwiched between two window air conditioners (have I mentioned it was VERY hot while we were there?). Besides helping my sister show my niece New York city, I was hoping my trip would offer me a little rest from the long hours I have been working and give me some new inspiration. It did both. I have always liked the idea of a casual farmhouse table. 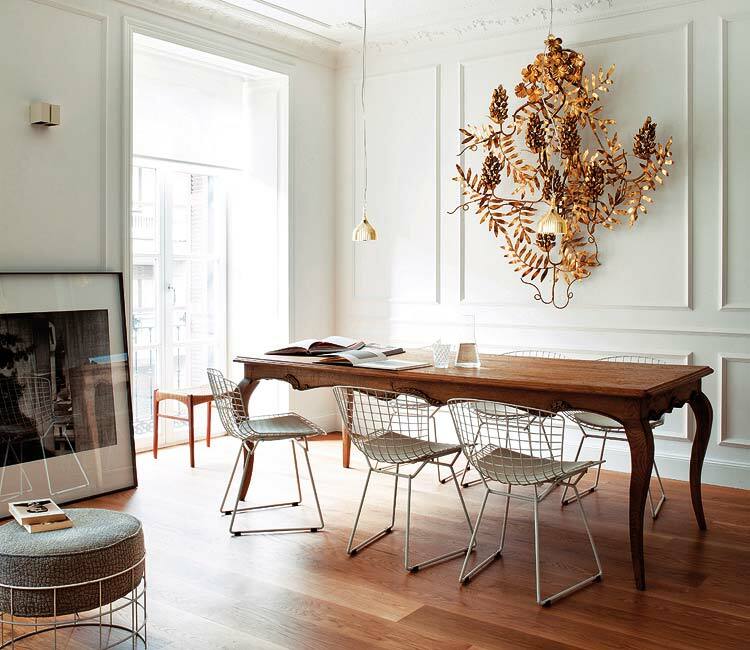 But what I am really enjoying now is the unexpected pairing of an old wood table with modern chairs. My dream house has a dining room large enough to have my own communal style table. And enough chairs for whoever wants to drop by. 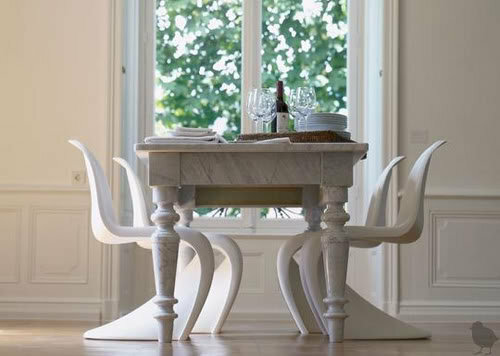 Preferably modern chairs ... and of course white. My favorites are the rustic tables with modern seating- a great look and I love finding new, great design blogs- I'm your newest follower! Gorgeous tables and rooms!! I love the look of a huge rustic table with white or metal chairs- even better if there's a mix of both! I like how you came up with your name! I also had no idea how popular it was until after I'd created my blog- it never crossed my mind to google it first to see how many others where out there. I chose it because I wanted to be able to write about all aspects of home design and decor- the inside and the outside. And "inside-out" sounds catchy. Beautiful inspirational pictures! I love the concept of mixing the old and the new, it's so refreshing and unexpected! My favorite pairing is those white tulip chairs with the farmhouse table. They look so gorgeous together! I have always loved rustic (and large) tables.....But the pairing of modern seating and rustic tables--I absolutely love! I love each and everyone one of these. There's just something about gathering all your friends and family around one long table piled high with delicious food...idyllic! Thanks for the inspiration! 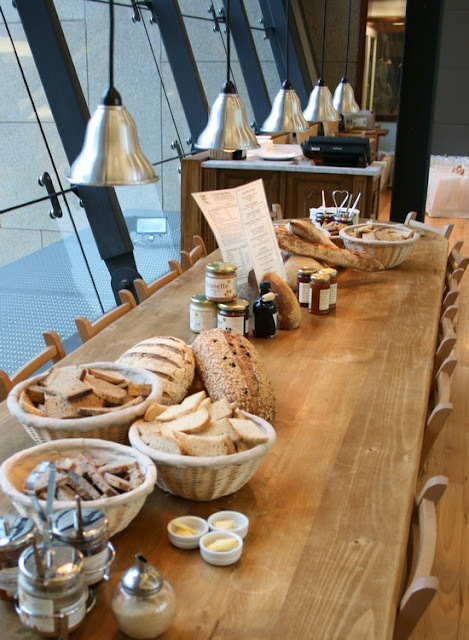 We love the communal tables and the decor at Le Pain Quotidien. They opened one about a year before we moved from new Canaan to CA. I do love the old farm tables with more modern chairs. My husband made our table 20+ years ago and I have wanted new chairs forever, but it seems there's always something more important on the list. Currently we have these wicker chairs that were about $30 each at pottery barn that I painted all black. We've had them for at least 18 years and they are so comfortable. I love restaurants and cafes with huge communal tables too. They just scream out "welcome". And if space allows it, they are great in people's homes too. We are lucky enough to be able to fit a 12 person huge table into our house, which is brilliant for large gatherings. Almost 3 metres long, so we can tuck a few extra people in if we need to. Spoilt! love your selections -lots of rustic mixed in with modern which is gorgeous.